Used in pairs, the CCTV Balun eliminates costly and bulky coaxial cable, allowing CCTV security and surveillance equipment to be connected using standard structured cabling techniques for neater and more streamlined cabling. The flexible mini coax cable lead allows the product to fit neatly inside CCTV camera back boxes and dome camera enclosures. 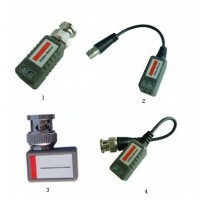 The CCTV Balun also works in conjunction with other CCTV baluns such as the AN-V-AR and AN-V-A series active receivers for a complete cabling solution.